Nanaimo Ladysmith Public Schools, City of Nanaimo and HasteBC Encourages Students to Walk or Roll to and from School. 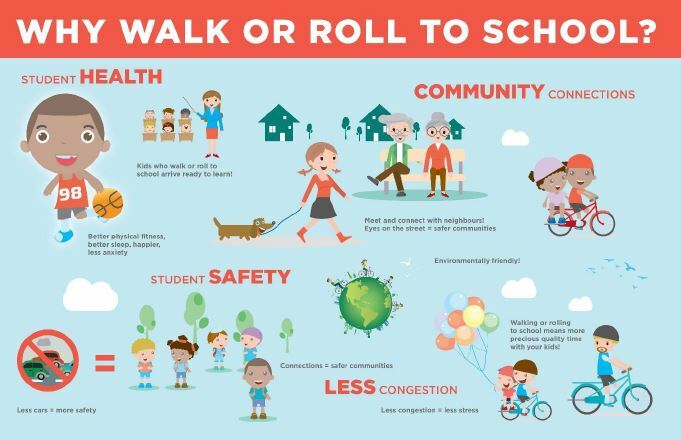 There are many reasons to walk or bike to school, and plenty of resources to help make your trip fun, easy and safe! The Active & Safe Routes to School (ASRtS) program aims to encourage and support students and families to travel actively and safely to and from school. Many parents and children already enjoy walking or cycling to and from school. We hope you will choose to join them! Biking to school? The City of Nanaimo’s Bike Map shows common bike routes perfect for planning your ride to school. View it online, print it out, or pick one up at your local community centre or bike shop to keep yourself riding. Biking is a great way to get around quickly and easily while building your child’s confidence and physical literacy. Walking is a great way to get exercise while traveling to and from school, and familiarizes your child with their local neighbourhood. Public transit can be part of an active trip to school. A recent study by the University of British Columbia found that transit users are three times more likely to meet recommended Canadian fitness guidelines. Visit the BC Transit Trip Planner to plan your best transit route to and from school. You can also download route maps and view transit alerts to help make your commute as smooth as possible. If there is no way around it, and driving is a part of your commute to school, carpooling is a positive way to reduce emissions while sharing the task of driving and making connections in the community. Drive-to-Five is an excellent option for students who must make part of their commute in a vehicle. Locate your school’s Drive-to-Five locations (link to Best Routes to School map): these are drop-off points that are about a five-minute walk away from the school. The Drive-to-Five method is a great way to be part of the solution to decreasing traffic congestion around the school (increasing school ground safety), and provides children with a chance to be active before school, better preparing them for learning in class. The school zone is a high-volume area where student safety is very important. All commuters, whether drivers, cyclists or pedestrians, must be aware and follow the rules in order to keep the school zone safe. Your School Travel Plan is the document that outlines all of the efforts that have gone into improving infrastructure and encouraging students and families to plan active trips to school. This document is a culmination of School Travel Planning efforts that began in January 2018.